With Bitcoin price increasing 160% on average over the last 12 months; Is Bitcoin still a good investment in 2016, or have people missed the boat? I look at all the fundamental & technical reasons why in August of 2016, Bitcoin still offers a great investment opportunity. (video) Bitcoin – The Birth of a new financial elite; or the end of the old one? 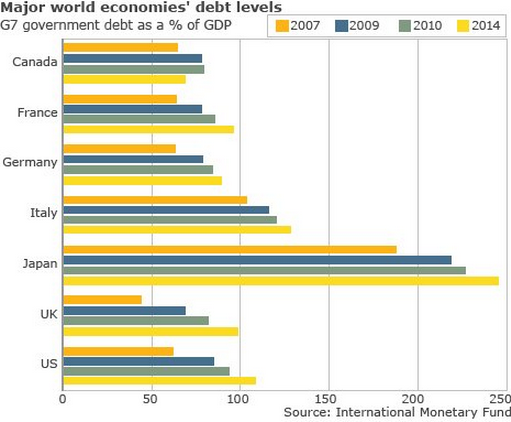 Soaring global debt – $57 trillion dollar debt increase since 2007! It’s been over 5 years since the epic events of 2008 that should have marked the end of the runaway fiat currency, debt saturated global economy which we have been thrown into by a combination of loose regulation and easy credit that was willingly administered by the quote, ‘too big to fail banks’. However, since 2008 it is fair to say there has been no real fundamental reform of economic policy, banking regulation and the very nature of the institutions that brought us to our knees. As a result UK debt levels continue to escalate. In addition to this there has also been no real evolution in the mainstream media’s (MSM) coverage and rhetoric on the fundamental reasons and critical state of sovereign debt levels. In particular how the need to maintain low interest rates on these debts, make any chance of a genuine recovery a near impossibility. Despite all the talk of recovery and ‘green shoots’ in the economy that I hear on a daily basis, backed up by the pseudo backdrop of record high equity markets, bond markets and a propped up housing market still benefiting from artificially low interest rates. It is still evident that sovereign debt levels mostly inherited by past bank bailouts and servicing of interest on that debt are growing worldwide and are predicted to grow further throughout 2014. Of course the chart above only shows sovereign debt, when corporate, financial sector, private debt and unfunded liabilities are factored in, the debt to GDP in the UK is estimated to be around 900% GDP. The UK’s approach to this crisis (as well as many other countries globally) has led them to quantitative easing (QE). This is essentially money printing where the central bank (BOE) monetizes debt through the purchase of government bonds (Gilts) from other financial entities such as banks and corporations. The two main objectives of this is supposed to keep interest rate low by creating artificial demand for gilts and to stimulate growth by funding SME’s. However, it could be argued that the very same forces designed to stimulate growth are actually undermining the real economy at the same time as the increase in base currency through QE and fractional reserve banking is causing asset price inflation in essential commodities. This in turn not only drives up living costs and reduces disposable income for large parts of the population, but has the knock on effect of damaging businesses due to reduced demand, leading to layoffs that create an excess of labor and dropping wages. What we have ended up with is a catch 22 situation that is not being widely discussed in the MSM. The very steps to try and resolve the crisis is undermining the real economy by driving up total sovereign debt which almost ensures the need for even more debasement of the currency through QE in the future, to roll over maturing debt and the interest on the sovereign debt. This in turn will again lead to more inflation and the erosion of purchasing power of fiat currencies including the pound, creating a dangerous negative feedback loop in the economy. With sovereign debt approaching £1.4 trillion and what looks like a reversal of the gilt bond market into a secular bear market in May of 2013, signaling rising interest rates on Index linked bonds and new gilt purchases. The opportunity for the government to make and meaningful reduction on the UK’s sovereign debt to a sustainable level, is looking more and more insurmountable. It could be argued the only reason there has been any strength and investment in the emerging markets and the reason most of the developed world have not posted double digit negative GDP figures since 2008, has been the unprecedented market interventions by the Central banks worldwide. They have essentially acted as a backstop for the global economy with policies such as the ongoing Quantitative Easing (QE). In the process, trillions have been added to sovereign, corporate and private debt worldwide and the expected growth from all of this intervention has not materialised. This was again recently highlighted by the massive ISM manufacturing index miss in the US. As central banks and government intervene in the free markets, with unprecedented sovereign bond purchases and distressed asset purchases such as Retail Mortgage Backed Securities (RMBS). They have created a Ponzi like scheme where only continued purchases of these assets in greater numbers, will continue to support the mark to market pricing of these assets on the balance sheet of the central banks and major financial institutions worldwide. In the US especially, sovereign debt has accelerated since 2008 up to $17.3 trillion. It has now hit levels that require even greater issuance of treasury bonds annually, in order to roll over maturing debt, interest on the existing debt and to keep interest rates low to prevent default. The fed has provided the artificial demand for these bonds and now owns 30-40% of the Treasury bond market. However, the danger of this has now been exposed, with the recent move by the Federal Reserve to taper back on QE from $85 billion to $65 billion on monthly purchases. Just a 23% reduction in monthly QE purchases has led to capital flight from emerging markets. On top of this it has led to capital rotation in domestic markets as the DOW, S&P 500, NASDAQ and Russell 2000 as well as global indices begin to accelerate losses, as investors begin to see the backstop for the economy and these markets as a whole taken away. With major indices slipping under their 200 day MA’s, there is now concern of even bigger losses and the emergence of a bear market in equities. All of this from a 23% taper is further showing how the Fed’s actions now in large determine the future outcome of the global economy and this is the biggest danger of the attempted taper. If the Federal Reserve reverses the taper in the near future in an attempt to appease global market selloff’s and contagion, it will highlight more than ever that they simply cannot stop the monetisation of debt to support the global economy and the inevitability of the demise of the dollar and other fiat currencies in their current state, will be further exposed. This could well and truly lead to the expected fiat currency collapses as people lose all faith in this global fiat Ponzi system and will potentially move us closer to the long expected capital rotation into finite asset’s such as precious metal’s crypto currencies and other commodities.